lightsaml/lightsaml: If you want to use SAML authentication you should manually install this package. Users with accounts - People with actual accounts in our application. Only users with accounts in our application can be authenticated. Authorizers are used to authorize user credentials against data that is stored by a particular authentication service (stored users, LDAP/AD, IdP etc). Key authorizer method is verifyCredentials. It receives an array with credentials and it is expected to return ActiveCollab\Authentication\AuthenticatedUser\AuthenticatedUserInterface instance on successful authorization, or null when authorization is not successful. Some implementations may decide to throw exceptions, to make a clear distinction between various reasons why authorization failed (user not found, invalid password, user account is temporarily or permanently suspended etc). Request aware authorizers go a step further. They offer a mechanism to receive PSR-7 request, and extract credentials and default payload from them (or based on them). This is useful when authorizer requires request data validation and parsing. For example, SAML authorizer will need to parse SAML payload in order to extract relevant credentials from it. Authorizers can be set to be exception aware. Such authorizers have handleException() method that should be called on authorization exception. 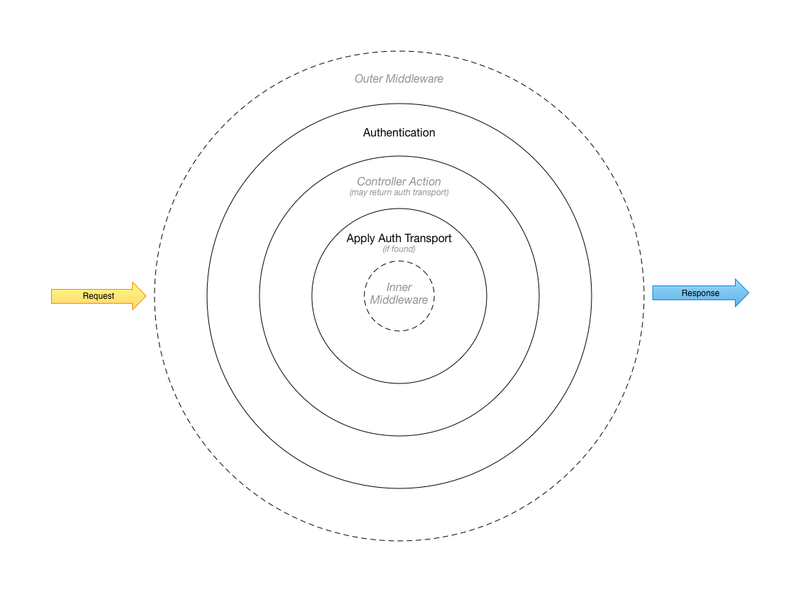 For system to consider an authorizer to be exception aware, it needs to implement ActiveCollab\Authentication\Authorizer\ExceptionAware\ExceptionAwareInterface interface. // Return true if incorrect password is entered multiple times, so user needs to wait before they can proceed. // Check if user password is OK.
Additionally, exception handling can be delegated to exception handlers. For default ExceptionAware to detect that authorizer uses handler to handle an exception, authorizer needs to implement ActiveCollab\Authentication\Authorizer\ExceptionAware\DelegatesToHandler\DelegatesToHandlerInterface. // Do something with an exception. AuthenticationTransportInterface is returned on initial authentication. It can be empty, when request does not bear any user ID embedded (token, or session), or it can contain information about authenticated user, way of authentication, used adapter etc, when system finds valid ID in the request. AuthroizationTransportInterface is returned when user provides their credentials to the authorizer. CleanUpTransportInterface is returned when there's ID found in the request, but it expired, and needs to be cleaned up. DeauthenticationTransportInterface - is returned when user requests to be logged out of the system. // Log attempt for user's username. // If third attempt, notify administrator that particular user has trouble logging in. // If fifth attempt, block IP address for a couple of minutes, to cool it down. onUserAuthenticated - (visit) User is recognized by its session cookie, token etc, so it was authenticated. Arguments provided to the callback are user instance [AuthenticatedUserInterface], and authentication result [AuthenticationResultInterface]. onUserAuthorized (login) User provided valid credentials, and system authorized it. Arguments provided to the callaback are user instance [AuthenticatedUserInterface], and authentication result [AuthenticationResultInterface]. onUserAuthorizationFailed (login failed) User tried to authorize, but provided credentials were not valid, or authorization failed due to other reasons (SSO service down, etc). Arguments provided to the callback are user's credentials [array], as well as the failure reason ([Exception] or [Throwable]). onUserSet - User is set - authenticated, authorizer, or app set the user using its own logic. Argument provided to the callback is the user instance [AuthenticatedUserInterface]. setOnUserDeauthenticated (logout) User logged out. Argument provided to the callback is authentication method that got terminated [AuthenticationResultInterface]. AuthenticationInterface interface assumes that implementation will be such that it can be invoked as a middleware in a PSR-7 middleware stack. That is why implementation of __invoke method in middleware stack fashion is part of the interface. System may request that authentication artifacts (like cookies) are cleaned up. Example above will tell ApplyAuthenticationMiddleware to check for authentication_transport attribute, and apply it to request and response if found. true // Apply when exiting middleware stack. Note: Reason why we do this in a separate middleware, instead of exiting part of Authentication middleware is because we may need to clean up request (remove invalid cookie for example). Later two are there for compatibility reasons only, so you can transition your hashed passwords to PHP's password management system if you have not done that already. Password manager's needsRehash() method will always recommend rehashing for PBKDF2 and SHA1 hashed passwords. Password policy implements \JsonSerializable interface, and can be safely encoded to JSON using json_encode(). Password generator uses letters and numbers by default, unless symbols are required by the provided password policy. Note that generator may throw an exception if it fails to prepare a password in 10000 tries. Log in, log out, password reset and update profile URL-s. These URL-s are used by adapters which implement off-site authentication, so application that uses these adapters can redirect users to correct pages. Login policy implements \JsonSerializable interface, and can be safely encoded to JSON using json_encode(). Consider adding previously used passwords repository, so library can enforce no-repeat policy for passwords.